Description : An exclusive Hanging Lantern with antique finish brass base is designed to add a touch of class. Under the guidance of our expert, we offer a wide range of metal Lanterns to our revered customers. These are fabricated using high value material which is procured from reliable vendors. We manufactured these lanterns in such a way that, these set examples in the market for its creative designs and spell bound look. Furthermore, our clients can avail these products at market leading rates. We offer a wide range on lanterns in iron, stainless steel, brass etc. The same design is in iron with powder coated finish. Beautiful Iron Table Lantern have been made by our craftsmen that are to be placed on the table for lighting purposes. It has a copper antique finish, which give them an antique look. Iron Metal Decorative Lanterns are designed using Iron and Glass. The beautiful design of Iron Lantern is appreciated by our clients. 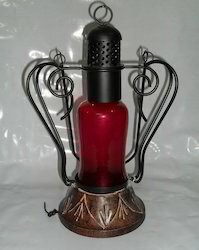 We have beautiful and new designed Iron Lanterns and have a wide range. These Lanterns developed from Iron Metal and Glass. Our Lanterns are in high demand for interior decoration among the national and global clients.